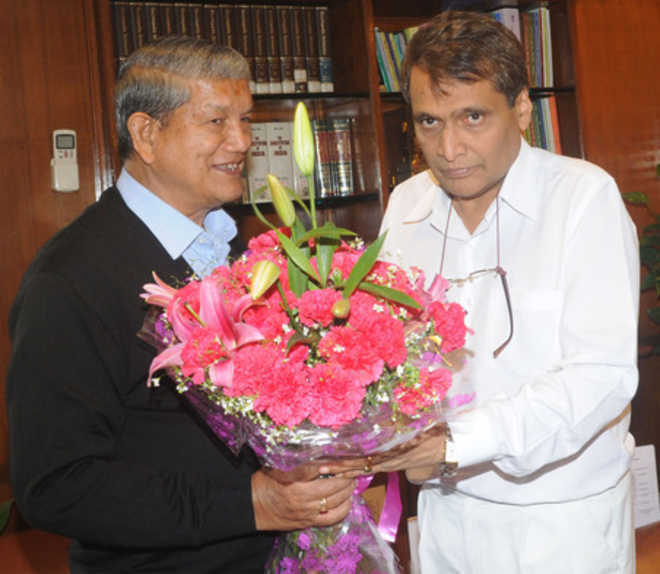 Chief Minister Harish Rawat in order to build pressure to incorporate various railway projects for the state in the forthcoming railway budget met the Central Railway Minister Suresh Prabhu in Delhi and kept several demands of implementing various projects and introducing new railway lines in the state today. Chief Minister Harish Rawat demanded expansion of railway services in the state and said that proposals in this regard were already sent to the railway minster earlier. Harish Rawat said that considering the inflow of tourists from around the country in the state it was imperative to develop strong railway network in the state in the larger national interest of the country. Tanakpur rail line as the land transfer for the project was in the final stages. He demanded laying of the rail line from Kiccha to Khatima and also apprised the railway minister that the state has already contributed its share and the railway ministry should speed up the work on the line in the larger interest of the people. He also demanded speeding up the work on the Deoband-Roorkee rail line,Saharanpur-Vikas Nagar-Dehradun rail line and creation of new line from Herbertpur-Vikasnagar to Dehradun. Harish Rawat further said that the rail line from Doiwala to Rishikesh was approved in 2013-14, for which the survey has been completed. Hence, it was important to start the work on the rail line without any delay. Rawat also said that the approval to the Haridwar-Kotdwar-Ramnagar railway line was given in the 2013-14 railway budget. So it was important to start the work on the project. He also demanded starting work on Lalkuan-Melani-Tanakpur-Pilhibit-Bhojipura-Bareily section metre gauge and converting it into broad gauge. He demanded several other direct lines for Ramnagar and Dehradun form other parts of the country. Harish Rawat said that the railway minster has assured considering the proposed projects.